Names have power. I think that’s one of the first things you learn, as a fantasy writer. If you grew up with fairy tales at all, you already know it to be true; guess the name of the wizened old dwarf and set yourself free, hide your true name and escape the evil queen’s notice. And names can begin to tell us what we need to know about people, like Snow White and Rose Red, Goldilocks and even Cinderella. All these names have meaning and prophecy, and if you know someone’s true name, you have power over them – this is one of the oldest rules. So when you start writing a fantasy book, you know that the names you give your characters, or the names they give themselves, are important. I have always subscribed to George R R Martin’s idea that “fantasy is written in the language of dreams”, so often I let my subconscious deal with it, which I suppose is a way of saying that I don’t have a particular method of naming characters. I just trust the right name to turn up. For example, some time ago now I happened to be reading Bernard Cornwell’s excellent King Arthur books, the Warlord Trilogy (I love them) and I came across the old name for Glastonbury Tor – Ynys Wydryn. Wydryn, I thought, would make a cool name. Or at least that’s what I thought on the surface. Underneath, Wydrin Threefellows, the Copper Cat of Crosshaven, was born in that moment. When I started writing The Copper Promise she stepped fully formed onto the page, her name as much a part of her as her red hair and her swagger. Sometimes (most of the time) I’m barely aware of the genesis of a name. Sir Sebastian was Sir Sebastian straight away, and it was only later I realised I’d been thinking of Saint Sebastian, the martyr pierced by arrows. Sebastian isn’t quite the godly martyr, but he is a good man who tries to do what is right at all times, and sometimes he suffers for it. Lord Frith seemed to come from nowhere, until a light clicked on in my head and I realised I’d named my tempestuous lord after the god of all rabbits. Which was more appropriate than it immediately sounded – Lord Frith has a slight superiority complex after all, so what else could he be named after but a god? Names have power, and you will know when it’s the right one. 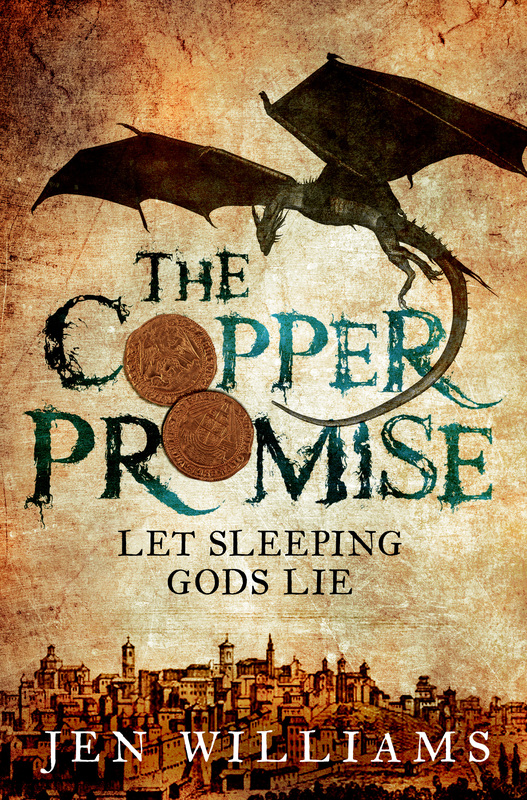 In The Copper Promise there are an entire group of characters for whom names are incredibly important, as a means of grasping individuality, of taking power for themselves – but I can’t say much about them here for fear of spoilers (although I will say that it was enormous fun to name them). And names can be important to characters in other ways. Wydrin cultivates her reputation as “the Copper Cat” in order to keep herself in coin and bottles of mead; the Copper Cat is known across Crosshaven and The Horns as a mercenary to be reckoned with, the sell sword you employ when you want the job done with a certain amount of style. Lord Frith’s name is more or less all he has left to him at the beginning of the book, and he will do nearly anything to preserve it – an attitude that has serious consequences for everyone else. It’s not all been plain sailing of course. I don’t want to give you the impression that I am blessed with some sort of magical muse that hovers over my head in order to excrete the appropriate name into my head at exactly the right moment. Sometimes it’s a bloody slog, and sometimes you sweat and scribble out ideas and none of them seem right. Sometimes you know a name isn’t right because it manages to change several times in the first draft, something you probably won’t notice until you’re making your way through the first edit. I had one character whose name I never liked at all, and I couldn’t figure out why, and then by the third draft I realised that his name was Holley: a male character became a female character, and BAM. It suddenly clicked. Another character, a right rum sort, had a name I rather liked until I realised it was the name of an island I had somehow picked up subconsciously. It wasn’t an island I knew, but someone would know it, and undoubtedly it would look strange as the name of a character in the middle of a secondary world fantasy novel. One character I named after my favourite bottle of wine, because sometimes you’re desperate, but as it turned out the name suited him; he was fruity and likeable and seemed like a good idea late at night, but not quite so wise early the next morning. And that’s often what happens. You name these characters as best you can and if you’re lucky they own those names, and become something more than a voice and a sketch in your head. Sometimes you name a character and they come to life. To a writer, that’s the most useful power of all. Jen Williams on Twitter, Facebook, and Web. The next person on the blog is author and friend William King, and his post will go up this coming Monday on the 23rd December. The full schedule of posts can be found here. Posted on December 19, 2013, in Debut Authors Guest Series, Guest Posts and tagged Epic Fantasy, Fantasy, Ghosts of The Citadel, Guest Posts, Headline Publishing, Heroic Fantasy, Jen Williams, magic, Names, Names A New Perspective, The Copper Promise, The Importance of Names, The meaning of Names, The Significance of Names. Bookmark the permalink. 2 Comments.